The US has accused China and Russia of using “opaque” and “corrupt” practices to expand their influence in Africa. 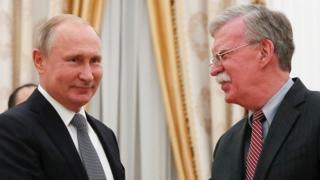 US National Security Adviser John Bolton said the two nations were “deliberately and aggressively” attempting to gain an economic advantage over the US on the continent. He said the Trump administration’s new strategy for Africa would focus on trade and countering terrorism. He warned the US would no longer fund “unproductive” peacekeeping efforts. “Under our new approach, every decision we make, every policy we pursue, and every dollar of aid we spend will further US priorities in the region,” he said in a speech at the Heritage Foundation in Washington. He accused China of using “bribes, opaque agreements and the strategic use of debt to hold states in Africa captive to Beijing’s wishes and demands”. He highlighted China’s influence in Djibouti, which he said was not only having a direct impact on the US’s military base there but could soon shift the balance of trading power in the region towards the east. Russia, he said, was seeking to increase its influence in Africa by advancing “its political and economic relationships with little regard for the rule of law or accountable and transparent governance”. He said Russia was continuing to “sell arms and energy in exchange for votes in the United Nations” and extracting “natural resources from the region for its own benefit”. The BBC’s Anne Soy says Mr Bolton’s speech could cause disquiet among Africans already concerned that their continent is being used as a platform to advance the agenda of global players. The US strategy may be viewed by some Africans through the same lens the Trump administration is using to assess China and Russia’s intentions in Africa, she notes.